I've come up for a breath of air . . .
and to take a little time to smell the roses . 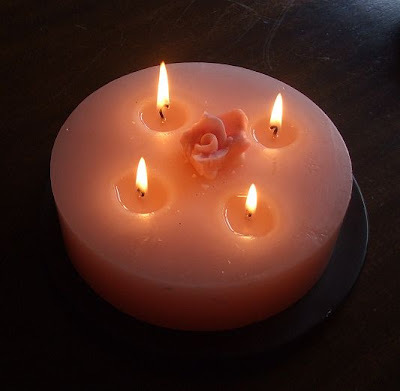 . .
and to enjoy my new rose scented candle (Spotlight $2.50!!!) . . .
while I pack up two days of Internet sales . . .
and do a bit of Blog catch up!!! Ages, why is it when I talk about a swap it always starts with ages . . . anyway . . . ages ago . . . 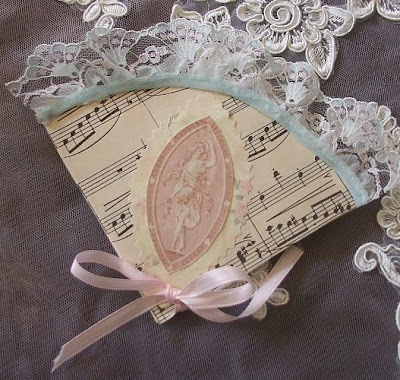 I joined the Enchanted Swap, my swap partner was the exceptionally patient Ms Sherry of Esprit *d Art. I have to say I was really excited about this swap and had a vision that took an age or month or two to execute. But I did get there in the end and this is what I made Sherry. 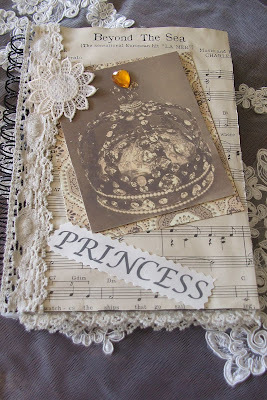 A Princess Journal using sheet music, old laces and millinery with a cream on cream basis to it. 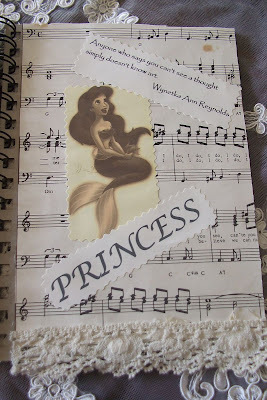 I was really pleased with how it turned out except that the blank journal I used had a type of plastic coated cover and my trusty hot glue gun had issues sticking to it. But here it is, front cover . . .
inside front cover . . .
inside back cover . 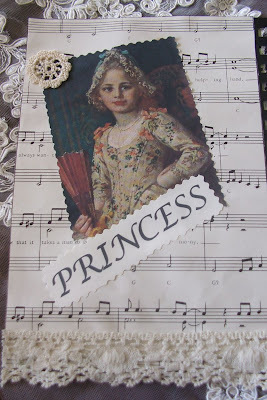 . .
Sherry likes vanilla scents so I 'tarted up' this handmade (not by me!) 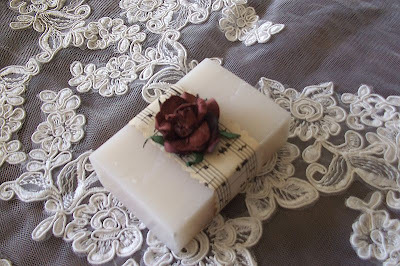 vanilla soap with a strip of sheet music and a mulberry paper rose. I sent her one of my fan cards and . 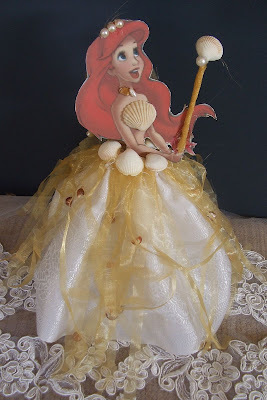 . .
what I think is the 'piece de resistance', an Ariel Art Doll. 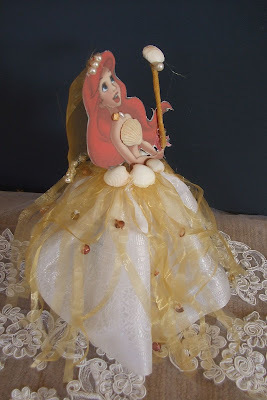 Ariel is one of Sherry's favourite Disney Princess characters. The Princess and I collected the tiny shells especially for this project from one of our New Zealand beaches . It was probably highly illegal to send them into Canada!!! More Ariel, I do think she is lovely!!! 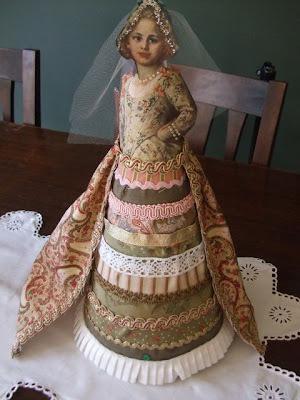 She is the second Art Doll I have made, the first went to Jerusalem in an Art Doll swap I did about this time last year. I joined it without even knowing what an Art Doll was!!! This one represents one of Jerusalem's favourite fairy tales, The Princess and The Pea. 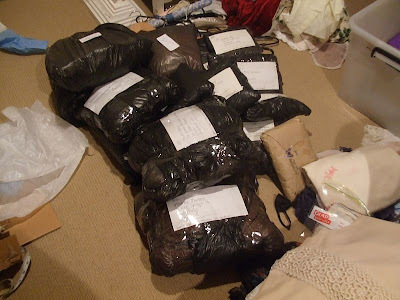 I am the worlds worst swap partner, I do deliver but this year none of my swaps have been on time! Or anything else on time for that matter!!! So a word of warning, if you sign up for a swap make sure you tell the hostess that you don't want to be paired up with that New Zealand girl because you would like your swap this side of Christmas!!! 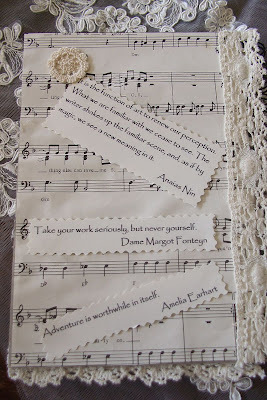 Unbelievably Sherry wants to partner with me for another swap we are going to do with Etsy Cottage Style . . . she's a brave one, that Sherry!!! A quick update, the garage revamp is going one step forward, two steps backwards but I will get there. I am so envious of all you lucky girls going to Silver Bella this year, one day, one year . 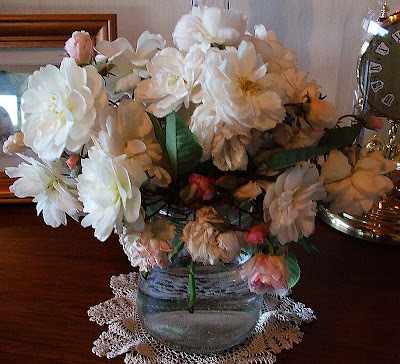 . .
Now, I must go, 600+posts on Google Reader to catch on, how mad is that!!!! Next post I'll show you what Sherry sent me . . .